This city is all these things and more. Hanoi is full of motorbikes, people, restaurants and shops. Its old quarter is devoid of stop signs or traffic lights. The honking never stops. Crossing the road is an adventure. Street and food vendors clog the sidewalks. As do parked motorbikes. And we loved every crazy minute of it. Vietnam's famous 'egg coffee'. Someone described it to me as tiramisu in a mug. Couldn't have said it better myself. The women of Vietnam are incredibly hard-working and industrious. They are entrepreneurs, shopkeepers, fruit and vegetable sellers and operate sidewalk eateries. They work tirelessly from morning 'til night. These women are my heroes. Pedestrians have to walk in the streets due to pop-up restaurants and motorbikes taking up all the space on the sidewalks. Banh Mi. The world's best sandwich. This woman carried all the fixings for soup on her shoulders to sell on the streets of Hanoi. Look at the size of that pot of broth! How heavy that must be for her. TGIF! Having a beer in the bar district. When customers spill out too far into the street, the police come down the road with their plastic billy clubs. Customers quickly pick up the tables and chairs to cram inside the bar until the police pass by. Once they're gone, everyone tumbles back onto the street and resumes the party. Anyone can prepare and sell food on the streets of Hanoi. All one needs is cooking fuel, a pot, some ingredients and it's off to the races! One of Joe's newest loves. Chè. A cold sweet soup. A bowl of coconut milk filled with brightly coloured gelatinous pieces of lord-knows-what and sprinkled with crushed ice. Another one of Joe's newest loves. Bun Ca. A fish broth full of barbecued pork. Greens and rice noodles are dipped into the broth. The proprietor seemed very happy that we enjoyed his food. When there's no room in the kitchen? Improvise by cooking on the garage roof. Picnic on the sidewalk! Life is lived outside on the street. A sidewalk food vendor washes her dishes on the street. 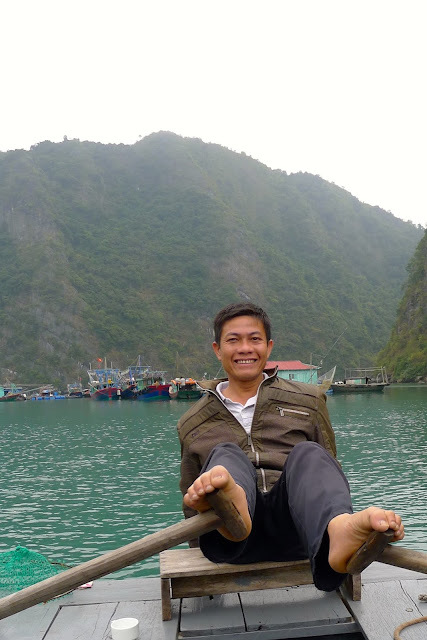 While spending an exhilarating week in Hanoi, we took a 3 day cruise of Halong Bay. The weather forecast was for rain, but we lucked out with only clouds and fog. It was so quiet and peaceful out on the calm waters. Our little cruise ship. The Pelican 2. Halong Bay in the fog. Joe went for a quick dip in the Gulf of Tonkin. Every morning and evening, women from the fishing villages would row out to the cruise ships to sell their wares to the passengers. Pringles, anyone? A family and their fishing boats. When your arms get tired of rowing, just use your feet! One of many floating fishing villages tucked up against the edge of an island. We went on lots of excursions. Our many choices included kayaking, hiking, caving, fishing and swimming. The limestone caves inside some of these islands were magical. The sun tried its hardest to break out from behind the clouds but was unsuccessful. These guys. Our happy hour mates. A friendly bunch from Australia, India, America and Canada. Our last morning on the boat. We had a wonderful time in northern Vietnam. All of our experiences in Hanoi, the Sapa Valley and Halong Bay were eye-opening and heart-warming. We are now on our way south to Huế and Hoi An. Looking for some warmer temps and more adventures.